Chad D. McEvoy is the new chair of the Department of Kinesiology and Physical Education (KNPE), effective July 1. He joins NIU from Syracuse University’s David B. Falk College of Sport and Human Dynamics, where he was a professor of sports management and graduate program director in the Department of Sport Management. Paul Wright, who served as interim chair of KNPE during the 2014-2015 school year, will resume his position as the Elizabeth C. Lane and M. Nadine Zimmerman Endowed Professor. “Northern Illinois University’s focus on student career success has been a passion driving my own work throughout my career,” McEvoy said. “I am thrilled to join a strong faculty and staff in the Department of Kinesiology and Physical Education. 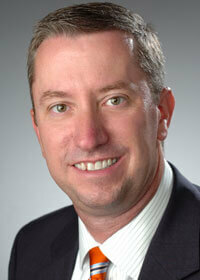 McEvoy’s primary research interests include revenue generation in intercollegiate and professional sport. Currently, he is working on numerous research projects related to ticket sales strategies, ticket pricing in sports and factors affecting sport event attendance, among other topics. In 2014, McEvoy was the recipient of the prestigious Sutton Award from the Sport Marketing Association (SMA). He has also served as a panelist before the Knight Commission on Intercollegiate Athletics in a discussion on the effectiveness of NCAA penalties for rules violations. Internationally recognized for his publications and achievements, McEvoy’s research has been featured in more than 100 media outlets, including the The New York Times, The Wall Street Journal, The Chronicle of Higher Education, “PBS NewsHour with Jim Lehrer,” New York Daily News, and USA Today. McEvoy is co-author of two textbooks in the sport management discipline, “Financial Management in the Sport Industry,” and “Research Methods and Design in Sport Management.” He is currently editor of Case Studies in Sport Management, having served previously as co-editor of the Journal of Issues and Intercollegiate Athletics. McEvoy is also currently serving as president-elect of the SMA. His educational background includes earning a doctorate in sport administration at the University of Northern Colorado with a doctoral minor in applied statistics and research methods. McEvoy also completed a master’s degree in sport management at University of Massachusetts, Amherst, and a bachelor’s degree in sport management at Iowa State University.